Remo Repair Word is designed with a unique algorithm capable of scanning and extracting the text from the corrupt or damaged Word file. Once Remo Word file repair tool acquires the text, the content is then saved as a new healthy Word file. The tool carefully repairs corrupt Word document without causing further damage to the source file. Word files created using MS Office 2016, 2013, 2010, 2007 and 2003 can be repaired with this tools aid. You no longer have to wonder how to fix corrupt Word file, with Remo Repair Word by your side all the important information on the corrupted Word document is reproduced to the very last stitch. Every minute detail from fonts, font size, hyperlinks and OLE objects are obtained in the form of a fresh new file. If a Word file is damaged or corrupt, it cannot be accessed either by Microsoft word or any other application. A quick fix for this problem is to repair and recover the content of the Word file. Remo Repair Word follows the same approach with utmost precision to keep your file safe. The tool employs a specialized algorithm to scan and retrieve the content of the inaccessible word file. 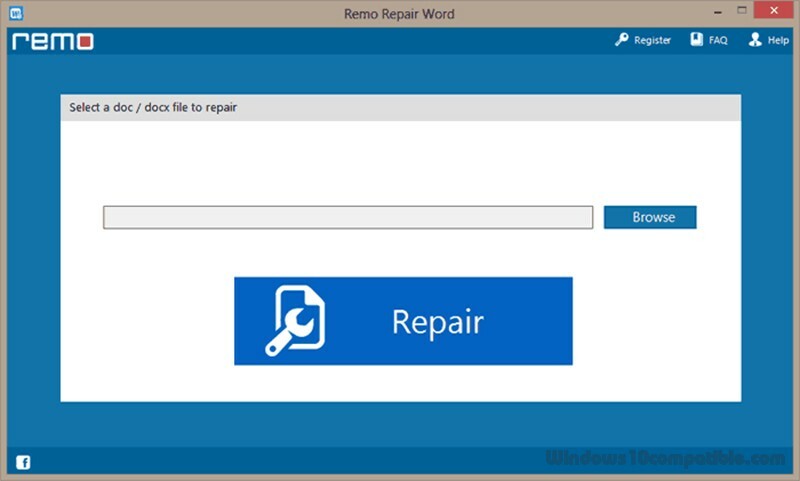 Remo Microsoft word repair tool automatically saves the extracted content into a healthy Word file without affecting the original word file. Features of Remo Repair Word: 1) Repair DOCX files and DOC files flawlessly using this software. 2) The software repairs the corrupt word file and recovers text, format, OLE objects, hyperlinks etc. 3) This software is compatible with Windows 10, 8, 7, XP and vista. 4) Word file created in Office 2016, 2013, 2010, 2007 and 2003 is supported by this tool. 5) A preview option is available to view the content before saving it to a new healthy Word file. It is to be noted that if the Word file is not responding, opening the file by any means will further reduce the chances of repairing the file. Main causes of Word file corruption are malware attack, sudden power outage, using third party tools to manage files, presence of bad sectors in hard drive, incomplete installation of Microsoft office etc. Proper handling of the file and regular maintenance of the computer can prevent the occurrence of any damage to the Microsoft Office Word file.